Rasmalai recipe is made from basic rasgullas in a thickened, flavored milk. Rasgulla is made from homemade paneer (cottage cheese). So basically, all this is made from milk. 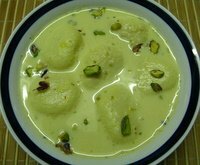 You can easily make rasgulla and then rasmalai at home. So here's how you make your rasmalai recipe. Step 1 - Making the Rasgullas (made in a pressure cooker). Boil the milk in a heavy bottom pan and slowly add the vinegar to it (a little at a time, add more if required). Lower the flame. Stir gently and when you see the milk has curdled and the water separated has turned almost clear pale green in color, it means your paneer is made. Turn the heat off. Put all this in a strainer lined with a muslin cloth / cheese cloth and drain the water off. Wash under a tap to get rid of any vinegar flavor. Let it drain properly. Then squeeze out as much water as you can. It is very important to take out any more excess water, place the wrapped paneer under a heavy pan or stone for about 10 minutes. This will ensure that all the excess water is drained out. Put this paneer in a food processor, along with the plain flour and process for 30 seconds. Alternately, place on a dry, clean surface and knead the paneer for 3-4 minutes until the paneer is smooth enough to be rolled into balls. Divide this kneaded or processed paneer into 10 or 12 portions. Make smooth round balls out of each portion by rolling it in between your palms and then apply slight pressure to flatten them. Just see to it that there are no cracks. Meanwhile, add the water and sugar in a pressure cooker and bring it to a boil (don't put the lid yet). Add the paneer balls and close the pressure cooker. Do not put the weight (whistle) on the lid. Let the steam come out. Cook on a medium flame for 15 minutes. Not any more. Close the flame. Wait for a minute and open. Kindly note :- Use a 5 lt pressure cooker for this, to make sure that there is ample space inside. The rasgullas tend to double in volume after cooking. Carefully remove the rasgullas in a bowl, using a ladle. Pour the sugar syrup on top. Let them cool completely. Do not disturb the rasgullas when they are hot as they might break. Boil the milk in a wide mouth vessel. Take 1/4 cup of milk out and crush the saffron strands into it. Leave it on a side. Simmer the rest of the milk and reduce it to half the quantity. Stir in between to avoid sticking at the bottom. Add the condensed milk little at a time. Keep tasting the sweetness. Stop adding the condensed milk when the sweetness is ok. Add the cardamom powder, pistachio powder and saffron milk (along with the saffron). Hold each rasgulla in between your palms and gently squeeze out the water (sugar syrup) from it. Now add it into the hot reduced milk. Repeat with all rasgullas. Now turn the heat off. Cover the pan/ vessel with a lid to prevent skin formation. Let it cool completely. Garnish with sliced pistachios. Now enjoy the chilled ras malai!